THE CONCEPT IS SIMPLE, "MINIMUM INPUT OF RESOURCES FOR MAXIMUM OUTPUT OF RESULTS". IT'S DELIBERATIVE ACTION. WHAT ARE YOU WILLING TO GIVE UP FOR WHAT YOUR WILLING TO GAIN? WE HAVE FORMULATED A VERY BASIC PROGRAM FOR OUR VETERANS. ONLY THOSE THAT TRY, GET. 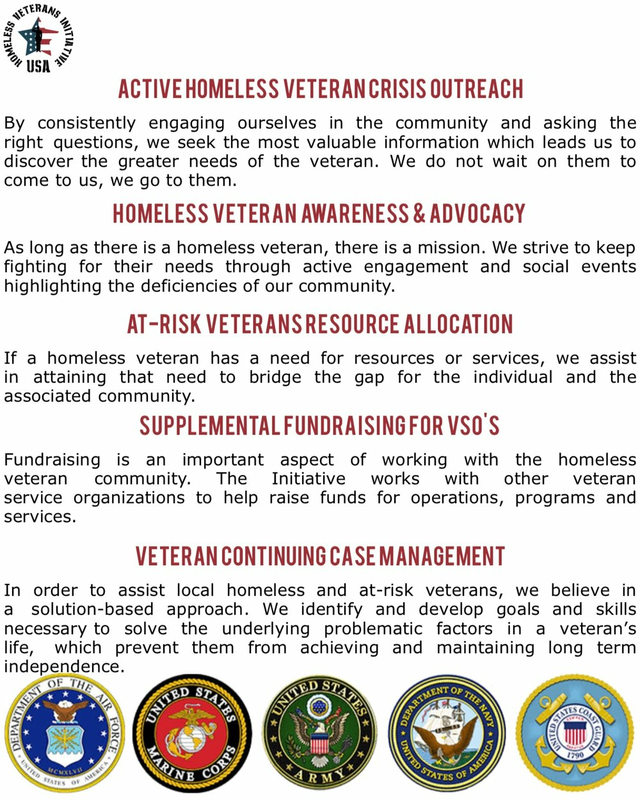 HOMELESS VETERANS INITIATIVE GIVES NO MONEY, SERVICE, RESOURCE OR OPPORTUNITY TO ANY VETERAN THAT DOESN'T PROVE THEY ARE WILLING TO MOVE FORWARD IN A POSITIVE DIRECTION DAILY. WE SEAK OUT THE VETERAN, OFFER ASSITANCE, AND HELP GUIDE THEM OUT OF HARDSHIP AS QUICKLY AND EXPEDITIOUSLY AS POSSIBLE. IT IS UP TO THE VETERAN TO COMMIT TO CHANGE AND WORK TOWARDS PROGRESS. NEVER GIVEN...ALWAYS EARNED!